Though there is much discussion about whether when serving we are hitting up, hitting forward, or even hitting down on the ball – the following podcast is done from the perspective that when serving the best action occurs from hitting up against the ball. On the serve you can use your shoulders to turn to run into the hit (rotation about the long axis), somersault where you arch your back to spring up and into the ball, and cartwheel also called shoulder over shoulder. But I am now believing (as well as have learned) that the longer you stay sideways the more you can cartwheel and the less likely you will jackknife. Please shoot me some feedback on this one! That’s a very useful ‘twist’ to help the club player with the serve. I admire how you turn your teaching experience into ‘pills’ with the right dosage. Serving is one of only movements that one HAS to learn and pay attention on how to hit. Yes there are basic movements to be taught but very minimal, imo. How does one “stay sideways” longer and timely rotate into the serve? Had to learn this the hard way.. My instructors frequently told me for 3+ years I was hitting my serve sidearm and behind myself. But had no solution to help my serve..The problem was, while my toss was out and in front of me, when I rotated to contact the serve i was facing the net on contact. I couldn’t see the ball and had to bend my arm to hit the ball. My toss was dropping without me knowing it, I was facing the net before contacting the ball and my body was already into the court. The ball was actually back behind me. I couldn’t reach the ball with my body out of position. I learned after watching live and video streams of the pros serving. Most, if not all hit/contact the ball on the serve from the side and finish/complete the follow thru facing the net. Its illusive when you see it on TV because it all happens so fast when pros serve. It’s easy to think they contact when they square up to the net. The ball is already gone before they face the net…Contacting the ball at the twelve, twelve thirty, or even one o’clock position is a matter of inches on the toss alone. Once I realized I needed to contact the ball from the side I found it easier to hit up, extend my elbow above my head, relax my arm, pronate, extend fully to the top of my reach, roll my shoulders end over end (cartwheel), and gained more (deeper) throwing dynamic from my racquet drop. Not only do I see the ball better, but I see it continuously throughout the entire serve motion until the ball leaves the strings. My serve is accurate, has greater spin potential, and has increased pace (100+) whenever i want it. I can hit any one of my five serves from the same toss and position because I can see and contact the ball from the side. Synchronization, timing, spacing, and momentum are all enhanced exponentially….So, YES. Staying sideways allows you to hit up. I have been practicing this method/transition for the last six months now. I LOVE my new serve!!!! Good on you for putting this out there!!!! (Good pro examples include Nadal, Verdasco, Almagro, KJokavic, Delpotro, Kygrios, Monfils, and Federer if your looking for the hip extension upto the ball and stretch/short before and after contact). Jim, that’s a great title for a great podcast. I struggled with my serve for over five years, trying different things, complicated analyses of the serve, and different coaches. Finally the right coach got me to try the cartwheel, as you call it, and the results sold me. For years I had blown off hitting up (really up) on the ball and trying to hit it harder toward the target. I watched videos of myself bending forward at the waist with my shoulders almost parallel to the net and often pounding it into the net or long. Since I realized the effect of staying sideways and hitting up on the ball, and the collateral benefits to my toss and hitting shoulder, I now focus my serve practice and attention on other things to to ensure that I keep sideways as long as possible and hit upwards. The cartwheel seems a little counter-intuitive, but the results don’t lie! P.S. It’s also now understandable why the pros and good servers land on their front foot. Hey Jim, I’ve been practicing this for the last six months..I sent you an email about my serve nightmare that went on for years. You are spot on with this serve application. I found, while the bend is at the waist, it’s actually the oblique side that bends as a result of the extended lift on the toss into the cart wheel action through contact. The bending is not intentional but happens naturally from hitting up and contacting the ball from the side. It’s a good thing… I love my new serves. Kick serve, twist serve, and slice serve-have been off the charts!!!! Thanks for putting it out there. Good on you sir!! Jim – I have great advances based on these tips. Think teaching the serve is truly one of your specialties. As for me, standing sideways and leading with the elbow can/has created a lot of power and feel more natural. My only challenge has been my own aging process. A few years ago I began pointing my toe at the net post to allow my hip an easier release but the unfortunate trade off has been opening up too early – thus losing power and hitting long. As a toe dragger standing sideways is also challeging – thus I’ve tried to add a tiny jump. There is little doubt to me that standing sideways and leading with the elbow (and the cart wheel) is what you see the best pros do – I am just looking for ways to manage my aching knees and sore back in the process. As always, your analysis is most insightful. Of all the different strokes, however, I feel that serving is the most individualized. That is to say, I don’t think that there is one “accepted manner” for everyone as there is, e.g., in a “two handed backhand”, or an “overhead smash”, etc. I see more “successful diversity” in serving motion on the amateur & professional level than on any other stroke. So much is involved in serving, I think that one has to tweak it to find his/her comfort level & then build “muscle memory”. What do you think? FWIW: I do “stand sideways” very much when my serve is working well, but I see others having success without doing so…thanks. Haven’t had a chance to try it yet, but your analysis resonated with every point. I have (and have had for some years) a stiff neck which has made watching the toss degenerate as a match progresses as watching just becomes too uncomfortable when you are also tiring. Great observation, looking forward to trying it. Thanks for your always insightful analysis. You are spot-on about the neck pain! For years I suffered with right neck strain. Tightness in the shoulder related to an old injury was causing me to rotate too soon with the consequence of having to crane my neck to see the ball with my dominant left eye (I’m right handed). Never realized it was my serve motion until recently, with the help of our tennis pro Keith Ferda. Now I concentrate on correct release FIRST, then driving up sideways and rotating late (after full extension of legs) and the chronic neck pain is gone. WILL TRY YOUR SUGGESTION. WILL TRY TO GET A FEW STUDENTS TO TRY IT. MOST OF THE TIME, HAVE ALWAYS TAUGHT THE TROPHY POSE WHICH MEANT YUOU ARE STANDING MORE TOWARDS THE NET, NOT SURE WHEN ONE OF ALL CHOICES IS BEST. It still amazes me that people don’t understand that the service motion is identical to throwing a ball straight up. In effect you toss a ball with your left hand and attempt to hit it with a ball you throw with your right hand (assuming right handed). To do this you must keep your back arched so you can see the ball you are throwing at. You are in reality throwing your racquet not another ball. You are not hitting anything forward. Your shoulder must go straight up at the ball. It must come over the top. If it is not over the top and is 3/4 or less you loose power because your are rotating forward rather than straight up at the ball. Unfortunately as you get older and loose flexibility this is very difficult to do. I was always taught, when my serves went into the net, that I was probably dropping my head. So, “Keep your head up!” became a mantra to prevent that. Do you think that is essentially the same thing that you are saying? It seems to prevent the same bending at the waist you described. It took me the longest time (& hurting my elbow in the process trying to ‘pronate more’), trying to figure out why I have no trouble with slice but just cannot hit flat serve. Eventually, I realize that I open up my chest too soon! Also, if the chest opens up prior to contact, I tend to cast the swing & rob myself of power. I love watching videos of tennis and try to see what is happening. Often I get fooled in what it thought I saw compared to what was actually happening so for me it takes a lot of times before I can understand the motion. On Federer’s serve it seems to me he does different things for different serves. When he hits more top spin or kicker type serves, he seems to stay sideways and tends to bend sideways at the waist into the court. On more flatter or slice serves, he seems to come almost square to the baseline. It can be difficult to see what he actually does also because he serves differently during his warm up practice than he does in a match situation. His starting feet positions can be quite different and for sure, he jumps much higher during a competitive serve. What is also surprising is that often, he does not look at the ball at contact. His eyes can even close while his head drops before that moment. It may be that trying to see the ball getting hit might actually slow the serve. I have seen this happen with other top players too. Just an observation. Hi Jim. I have played around with “stay sideways longer” from time to time. I have a timing problem. As I rotate into the hit, my momentum causes me not to maintain sideways as I desire. I work on my service games a lot…your so rightaboutthe sideways idea. I teach some n tell folks to turn into the ball…it works well also serving into the sun…looking sideways at the ball..of coarse ball torse is important…realise the ball he lost moment. Not too early..keeping the arm up as long s you can. Jim nice article. I have improved my serve a great deal by staying sideways and cartwheeling. In doubles I used to start facing the net way to early as my serving time went on. I now stay sideways longer and try to finish with my elbo lifting up and then to my pocket. It has added spin and control. I have played forever and love this new aspect of my serve. Hitting sideways is also referred to as (shoulder over shoulder) and not only is helpful when hitting a first serve but also protects the dominant shoulder from pinching which causes pain. By keeping the chin up while contacting the ball adds to keeping the entire body up during the serving motion. The second serve is hit with the shoulder moving across from left to right (right handed boaters) and requires that you stay sideways. Ahhhh, the joy of lifelong learning, and applied to tennis, the game for a lifetime! I changed to doing almost exclusively cartwheel a couple of years ago. I try to create a wave with my body by first jutting my hip back and shoulders forward, then hip forward and shoulders back with the left shoulder high and the right shoulder down. Then cartwheel my shoulders as I try to make contact in front of my left foot and slightly forward. My power increased dramatically when I started doing this. Watch Stan Wavwinka’s serve. He is doing just that + plus powering off with his legs (which I can no longer do). Jim, as always really good perspective. this one on staying sideways. Over my 40 years of teaching tennis I have increasingly left out the words, “follow through over the left side of your body” (for righties). I now say “follow through up” or “finish up” which helps students not “bend at the waist” pulling the ball down, often into the net. This also helps them learn topspin faster, and eventually some “kick or American twist” on their serves. I always look forward to your emails. The way I am being taught to get more power is to bend backwards, my back to the net, bring my right toe to the heel of my left foot, keep my eye on the ball throughout, then hit up on the ball as I use both feet to throw myself up and into the court as the racket finishes to my left side. The core turn and cartwheel motions improve velocity and accuracy. I am a right handed player and it seems to work for me. Thank you for your tips which I find helpful. Shoudn`t name drop but I was told (secondhand) that Frank Sedgman (Australian Champion 40`s 50`s) advised staying on the side as long as possible. Great video, Jim! Hope. All is well. Thinking one should stay sideways on all shots – FH, BH, volleys, overhead, drop shots. Would you agree? Jim- the reason we need to stay sideways longer is the serve grip (continental) so that on contact the racket face is facing the service box. 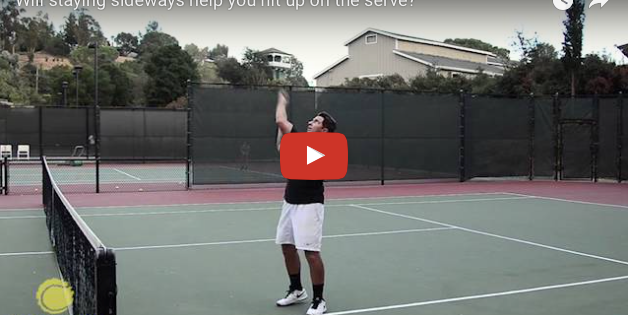 Open up too soon and your serve goes to the left for a right handed server. So why hold a continental? Because with it we can execute a throwing motion much better than if holding a flat straight-up eastern grip. But we don’t hold a continental to accommodate staying sideways longer. What I mean Jim is that a continental grip enables or allows for a throwing motion & swinging up to the ball on edge better than a forehand grip, not that the continental grip necessarily creates the motion. You are a master! So correct about staying sideways and the “cartwheeling! My world changed when I discovered the importance of the non-dominant arm pulling aggressively to enhance the cartwheel. The player can, and usually does create two rotations: about a vertical axes along his body, and about a horizontal one, that runs about his waste. The second rotation can be sideways (Sampras did it), forward, or both. Both rotations contribute to the speed of the ball. The first contribution is from the racket rotation in a horizontal plane above the player’s head, the second – from racket rotation in a vertical plane about the player’s wrist. Hi Jim ,I have enjoyed your insights over the last year since discovering your web site. I could not agree more with you as having taught for 25 years one of my more successful drills is serving sideways and hitting up and out while watching the ball. I ask the student to not rotate around the long axis and keep their head on the contact point long after having made contact. then with out having them look ,I ask them if they felt like they made their serve in the service box. It is most of the time . Keeping the head up and watching the ball through contact is critical to a consistent serve . Keep up the the great job of sharing info. I have been playing tennis for 30 years (only a 4 player though) and discovered the stay sideways technique for the serve this summer. better late than never. I am going to have to come to your tennis clinics one of these days.